We are often asked “what size unit do I need?” and this Storage Estimator page was set up to help answer this question. Obviously everybody has different needs and it is difficult to give a definitive answer, but this is a rough estimation of what you can fit into a selected range of our self storage units. 30 SQ. FT: These units are large enough for the contents of an estate car or a small people carrier. 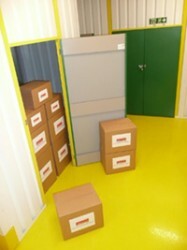 If you are looking to store quite a few boxes and/or some small items of furniture then this unit may be ideal. 35 SQ. FT: These units are large enough for the contents of a small van, estate car or people carrier. If you live in a studio flat then this unit may be right for you. 50 SQ. FT: This is approximately the equivalent of half a standard garage, and would fit the contents of a Transit size van inside. If you live in a lightly furnished 1 bedroom flat then this unit may be right for you. 75 SQ. FT: This is approximately the equivalent of three quarters of a standard garage, and would fit the contents of a Lutonvan inside. If you live in a 1 bedroom flat/house then this unit may be right for you. 100 SQ. FT: This is approximately the size of a standard garage, and would fit the contents of a small removal van inside. If you live in a 2 bedroom flat/house then this unit may be right for you. 165 SQ. FT: These units are suitable for the contents of a 7.5 ton truck. If you live in a 3-4 bedroom house then this could be the size for you. 200 SQ. FT: These units are suitable for the contents of a large removal truck. If you live in a 4 bedroom house then this could be the size for you. Remember our units range in size from 10 sq. 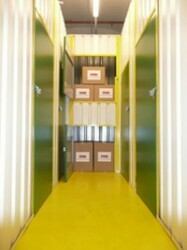 ft lockers (for just a few boxes) up to a 270 sq. ft room (the size of a shop) – so we are confident of providing the right size self storage unit to meet your requirements. Please feel free to call in and take a look around – there’s no obligation to buy and our staff will be more than happy to assist you. We hope this Storage Estimator page has been of assistance to you. If you need more information please do get in touch with us.